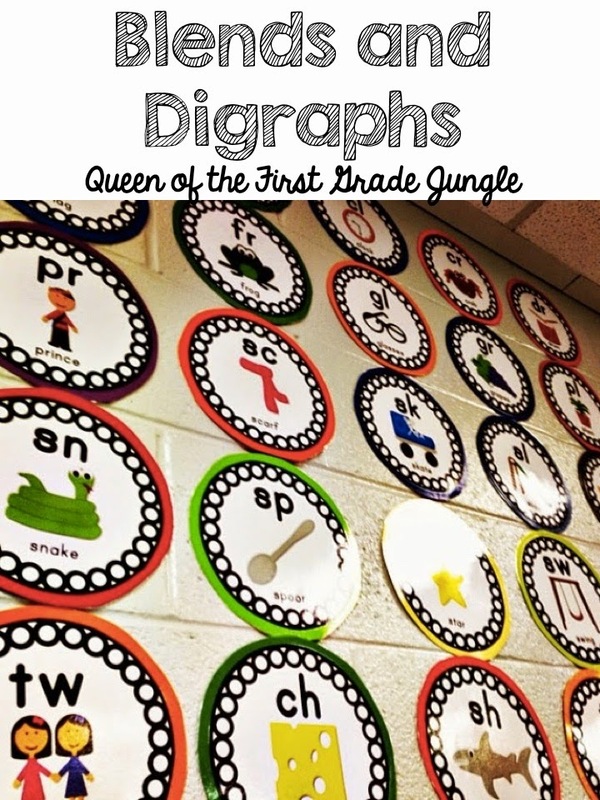 I LOVE my Blend and Digraph Posters. 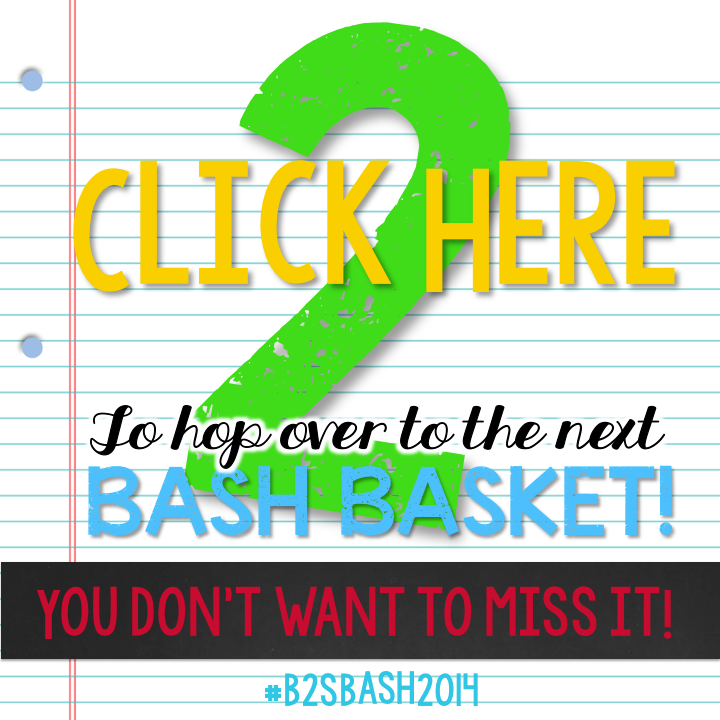 It might be because I worked with Ashley Hughes to come up with the graphics, but I just can't get enough of them! 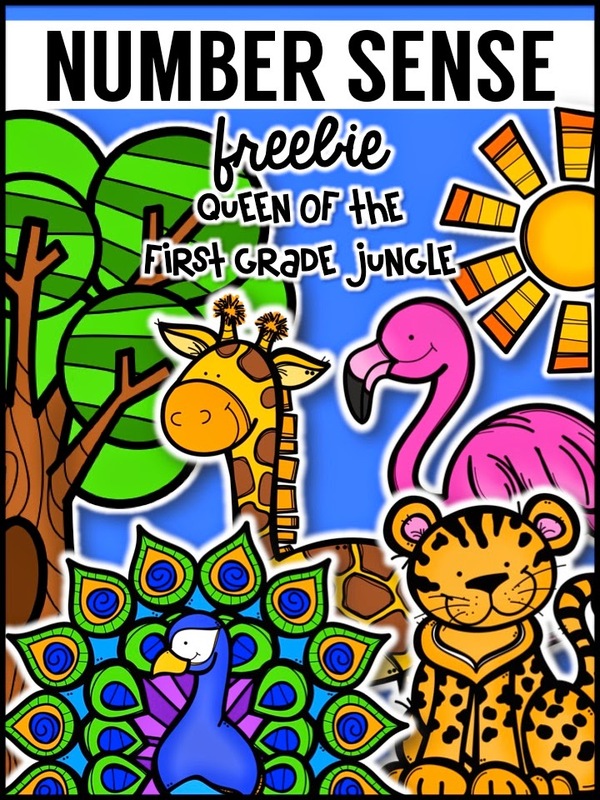 This packet contains not only the posters, but flashcards, printables, whole class activities, and literacy centers! Today through Friday you can find this unit for 20% off OR you can win it! You buy massive amounts of school supplies just because of the price and the fact that you MIGHT need them. and last but not least- you head back for MORE storage. I found these tubs for 5 for 4.50 at Walmart. Here is an update on my group storage! I had lots of people what I am putting in these drawers SO here is your answer! I put this picture on Instagram and I received TONS of questions so here are your answers. 1. This is my Word Wall. We are blessed with tremendous storage but zero wall space and one bulletin board. 2. I do NOT put up all my words to start. These words currently posted are the first grade dolch and fry words. My reasoning is that I want my students to have a list of expected/no excuses for misspelling starting point. 3. I will introduce 5 new words each week to be added to the wall. 4. To make: I put together two pieces of scrapbook paper and glued on my Word Wall Letters from my Black and White Decor Pack. Then I laminated the pages. I made these last year and they still look brand new! And the last two pictures are for you teacher mommas. Our sweet babies spend a lot of time with us while we set up our rooms. Lots and lots of sweet memories stem from that time with them. I feel incredibly blessed to have a job that not only do I get to spend 2 months every summer with them, but I also get lots of after school time, sightings in the hallways, and ALL their special school events. 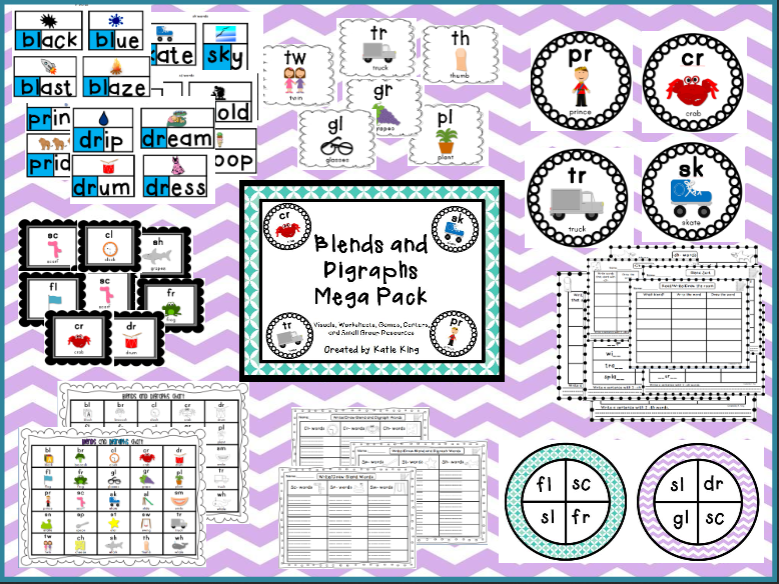 For the last two days of the Christmas in July sale ALL of my Busy Teacher packets, including the bundles are 20% off. New Desk Arrangment and Christmas in July Continued! My teammates and I have lots of discussions about seating arrangements. They like rows. I prefer group seating. To each their own, but hear me out. 1. 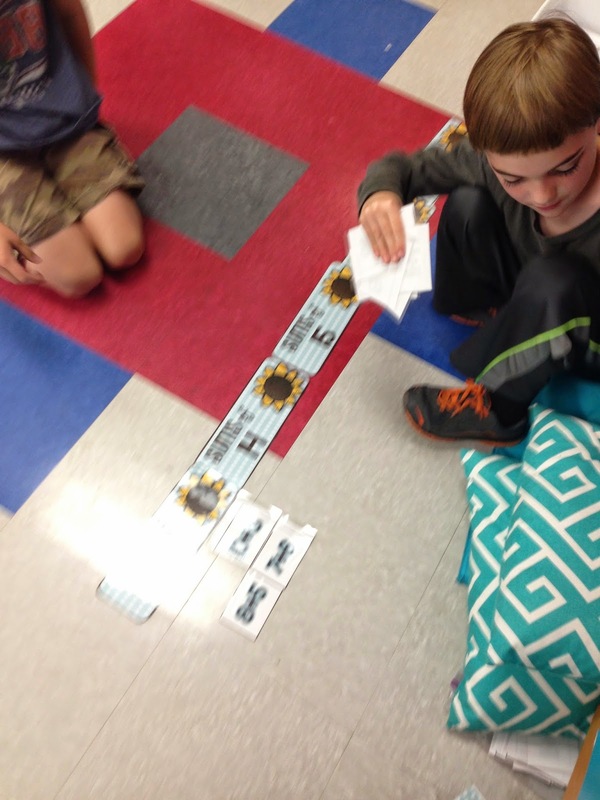 Cooperative Learning. My first year teaching I was blessed to attend a full week training on cooperative learning at the Kagan Institute. 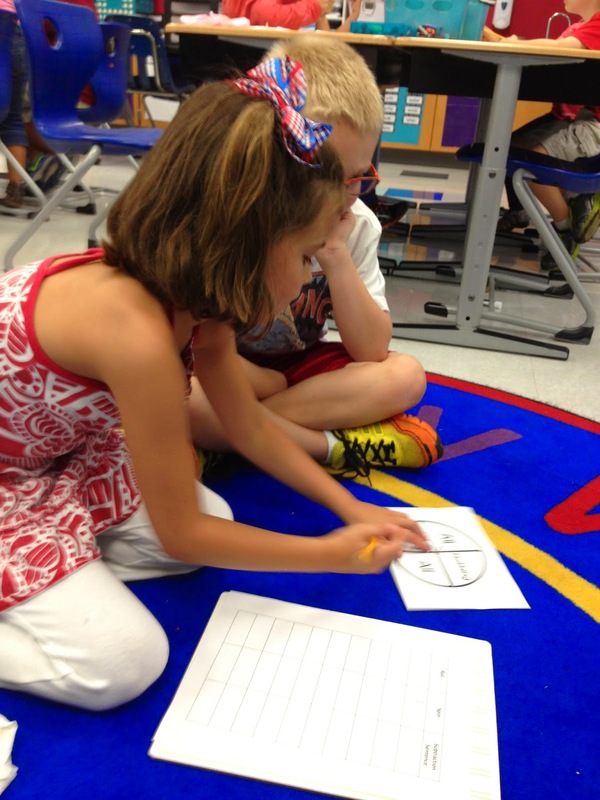 Kagan stresses the importance of engagement and accountability which you can accomplish through structured group work. 2. Communication. I am going to make myself feel really old here, but now more than ever we need to teach our children to communicate. So many of our kids sit in front of televisions, ipads, ipods, or iphones without having to speak to other human beings. They need us to show them how to speak purposefully and kindly. 3. Relationships. Kids build great relationships with each other during the school day. Let me give you an example. I had a little girl come to my class from Mexico last year. She knew zero English. She was scared out of her mind. I purposefully sat her beside a kind and chatty little girl. They became the best of friends and were inseparable by October. I attribute their friendship as the majority of the reason my little girl from Mexico learned to speak English proficiently by the end of the year. 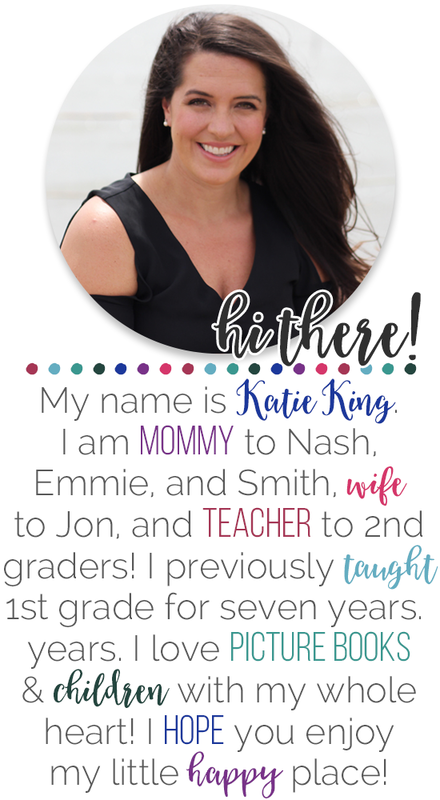 For all of these reasons...I will be heading into my 9th year of teaching with kids in groups of four, but this year with a little twist. 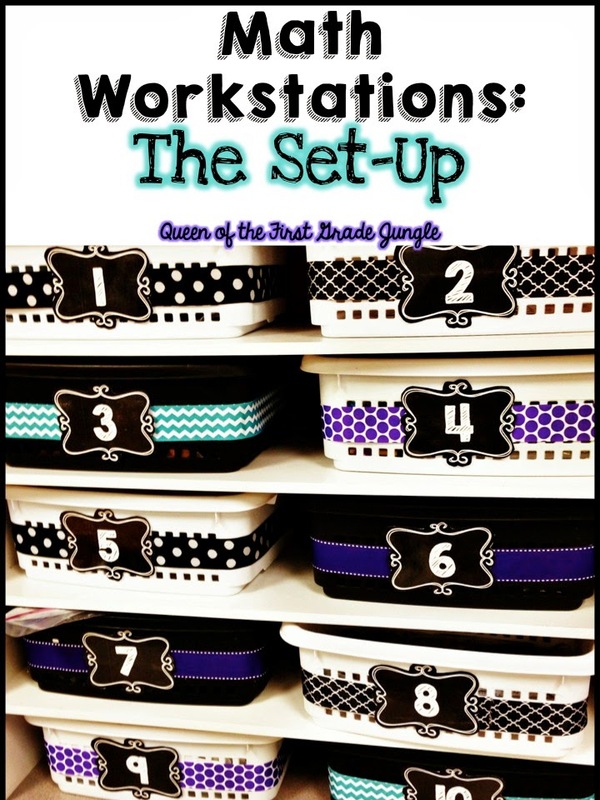 I will be adding labels to the front of the containers and table numbers to my caddies as well, but I wanted you to have a teeny peek in what is going on in my room! 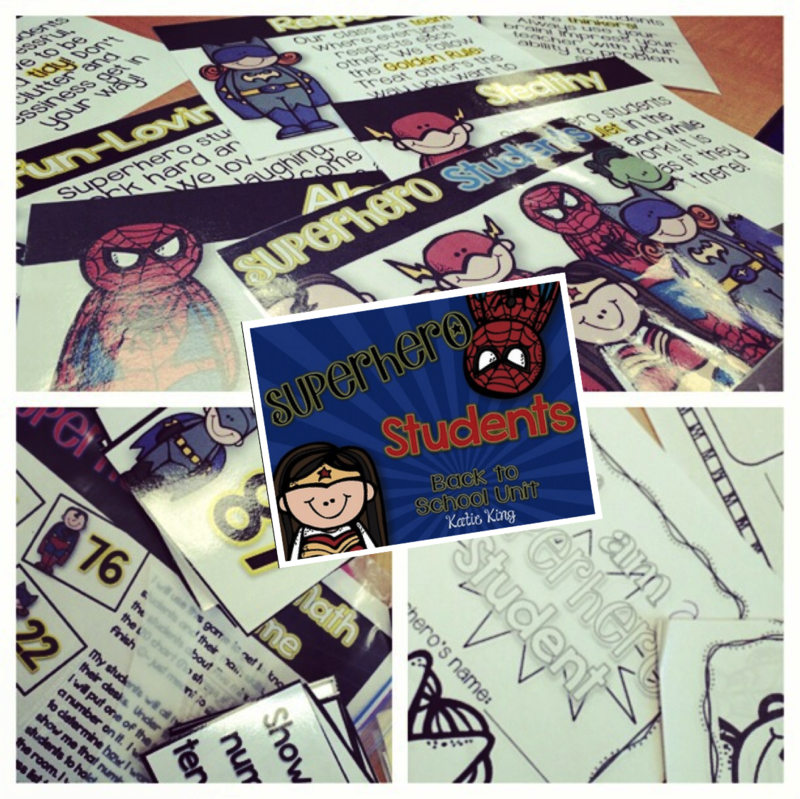 In other news for Christmas in July I am putting my Superhero Back to School Unit on SALE today and tomorrow! You can snag it for a really good deal! Here are my own cuties using my unit at home! 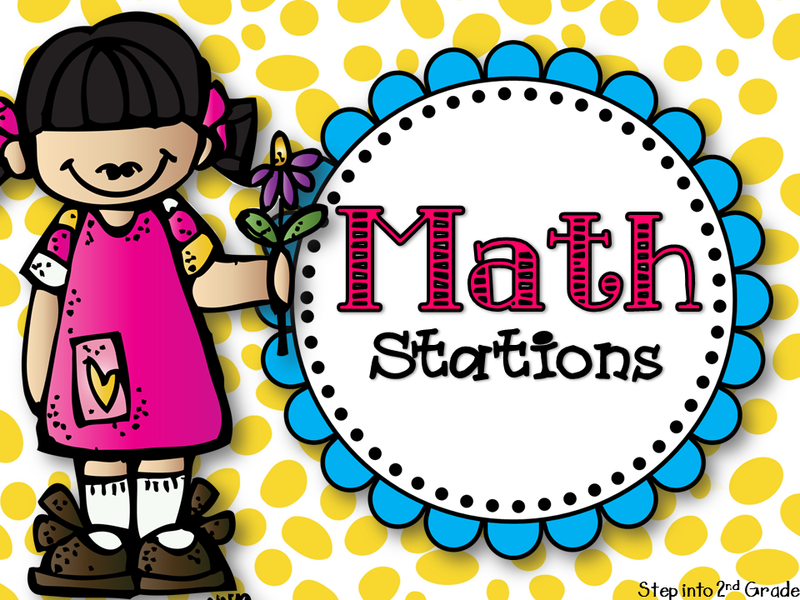 So I TOTALLY teased y'all a few months ago with a series of posts about Math Work Stations. I had a great first post and then ***WALL*** I ran smack into the end of the year crazy. But I know will forgive me, because let's face it- the end of the year is sink or swim! And those little 6-8 year olds are like a hungry school of sharks smelling blood. I swear the come after their poor, tired teachers! 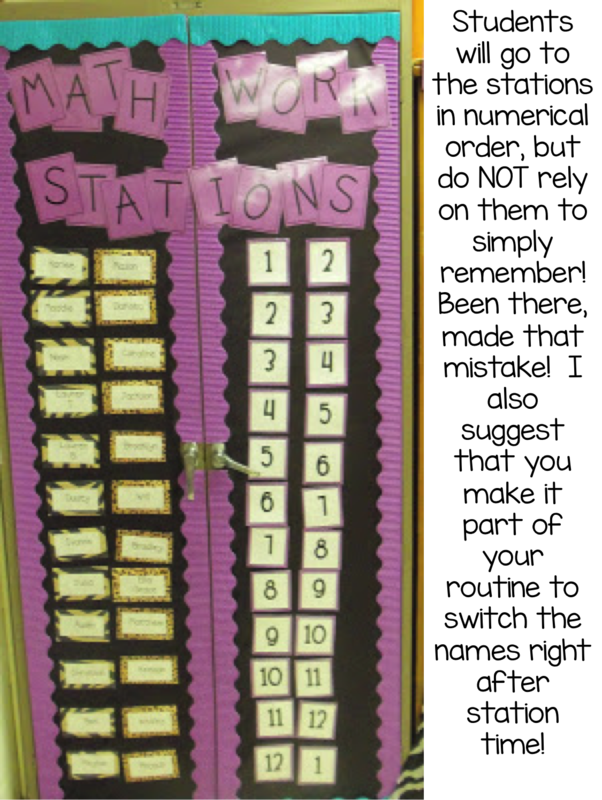 If you would like to refresh yourself on Math Workstations Part 1: The WHY here is your link. I tried to break this post apart into sections that make sense to me. Disclaimer- I am obviously not the be-all-end-all math workstations guru. I am a teacher just like you. 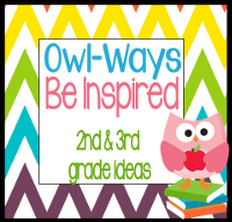 I like to try new things until I find what works for myself and my students! I encourage you to do the same! Your students need to know where they are going without you have to tell them. 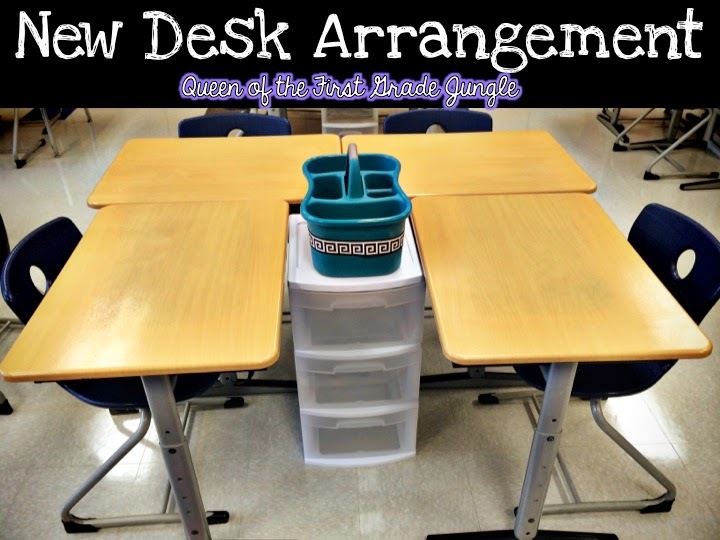 Of course this will take practice and reteaching, but eventually you can dismiss your students to workstations and they automatically should know where to go. Here is what the top of my board from this year looked like. Each name is backed with velcro sticky dots so that each day I can move their names. 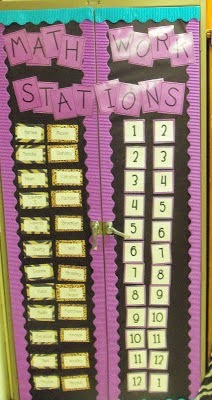 My students go to two workstations a day hence why there are two numbers by the pair of students' names. When I move their names at the end of the day, they will go down two spots. Something that I have found in my 8 years of teaching (which most of you will say--duh!) is not to rely on tape when you will be moving the names frequently. Magnetic and Velcro strips/dots are my friends! I have tried a TON of different baskets, but I puffy heart these. I found them at Walmart, but I have also seen them at Target. 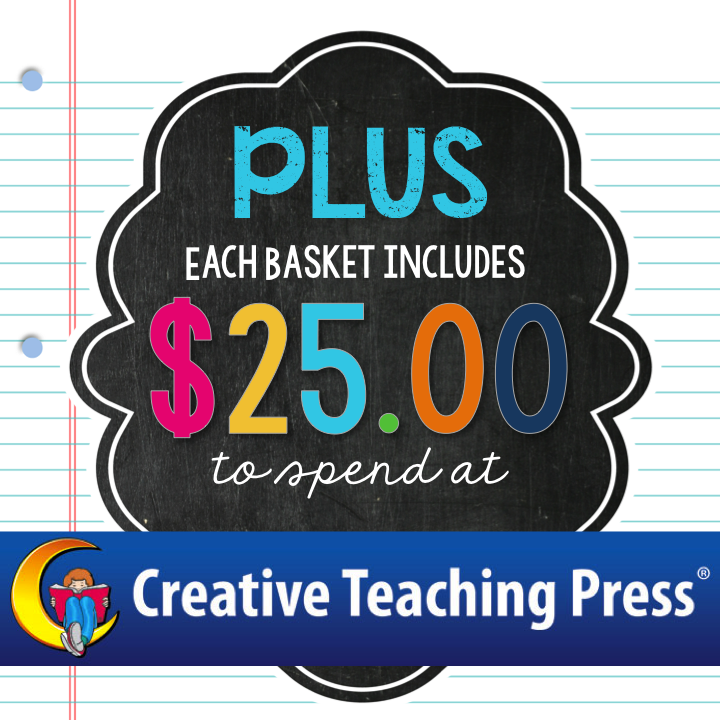 The reason that I love them so much is that they are the perfect size for paper, the center, and any manipulatives the students might need. To make the baskets pretty, which is obviously very important, I hot glued ribbon from Hobby lobby around the outside of the baskets. I then hot glued the labels on the front. These labels can be found **Here**. 1. Center 2. Manipulatives 3. Recording Sheet. 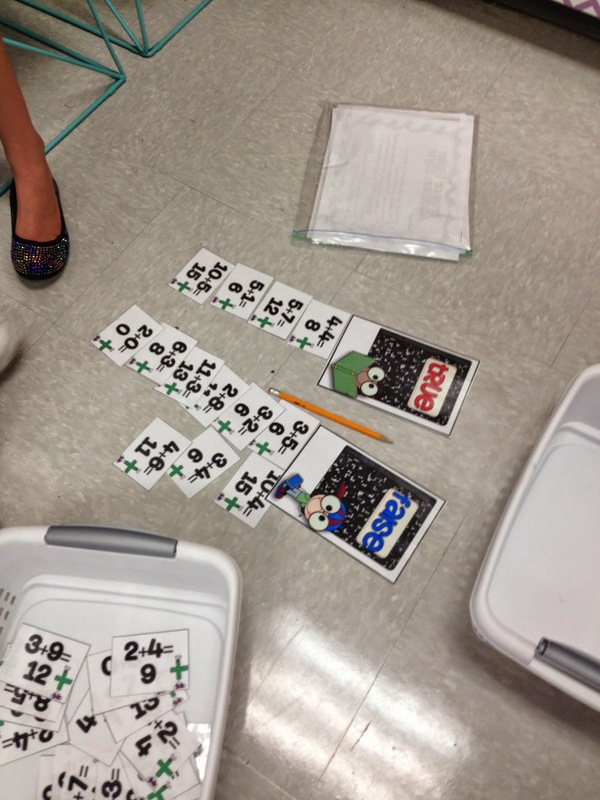 This particular Math Work Station can be found in my Sum Fall Fun pack. 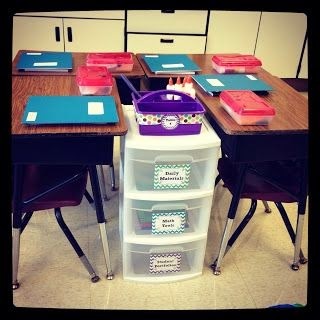 Erica Bohrer organizes her centers in similar baskets! I have mixed feelings about recording sheets. I always include them in my TPT packets, BUT I don't always use them. It seems when there is a recording sheet, sometimes my students rush to finish and be done. So if they are in a groove and being productive I will save the recording sheet as like a "Flashback" or Exit Slip for another day. 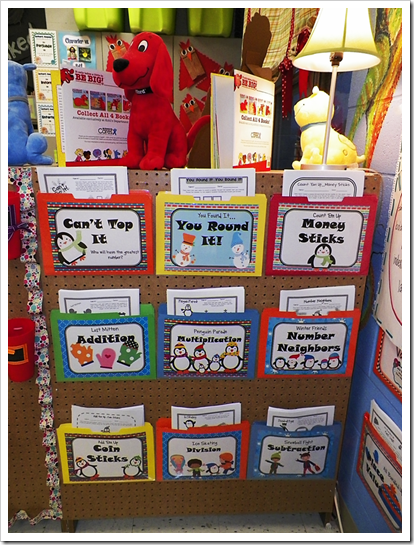 I am including a few other examples of how people organize their Math Work Stations/Centers. Like I said earlier, do what works for you! If it seems difficult to manage when you are setting it up, chances are you will abandon it! Don't set yourself up for failure! This section is hard for me, because I usually abandon my system about half way through the year and then spend WAY too much time reorganizing each summer. I will tell you that one thing that does work for me. I like to have a section for all my seasonal stuff like St. Patricks Day and Dr. Seuss would all be in a March tub/file. 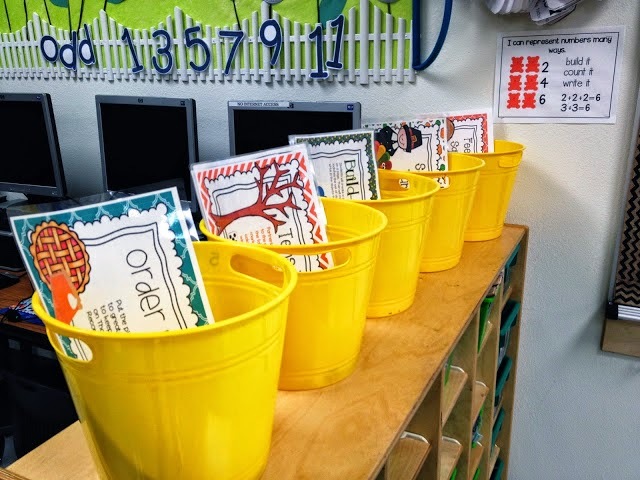 Then I also have non-seasonal tubs/files for big Math Topics like money or time. This way if my kids are struggling and need more practice with a subject I can go to my non-seasonal tub at any point throughout the year! And because I am locked out of my room, sadly I have not pictures for you yet. I will update as soon as I do! When I put my students in pairs (Yes I think this is better than groups of four or more). I will put students in groups of three for special circumstances if I have to. Like last year, I had a minimal English speaking child who needed more language support. I will occasionally put three low students in a group if I need to, but like I said in the previous post I personally do not believe in putting the high students with the low students to coach. I want my high students to challenge each other. I want my low students to feel comfortable asking questions and not copying their peer's answers. My students are allowed to work anywhere in the room that they would like. I like for them to spread out as much as possible to help with noise. If they want to, they can work at desks, but the majority of my students prefer to work on the floor. At the beginning of the year I do not have Map scores or data to help me group students so I will conduct some informal observations to help me pair students. I also warn students that their partnerships may be short term and I will switch them up if they aren't working smoothly! After I get everyone settled in I like to keep the partnerships for at least a quarter. 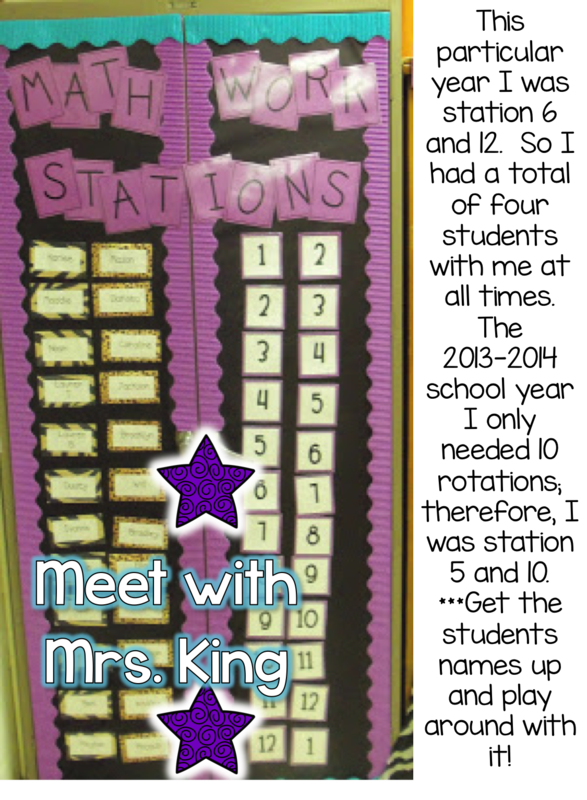 I like students to get to know each other well and to create a bond through this learning! I am just going to touch on this a little bit for now, but when students come to me for small group, they come in groups of four. When I set their names up I try and have students with similar abilities coming to me at the same time. Meaning all four kids at my table need the same thing from me whether it is remediation or acceleration. 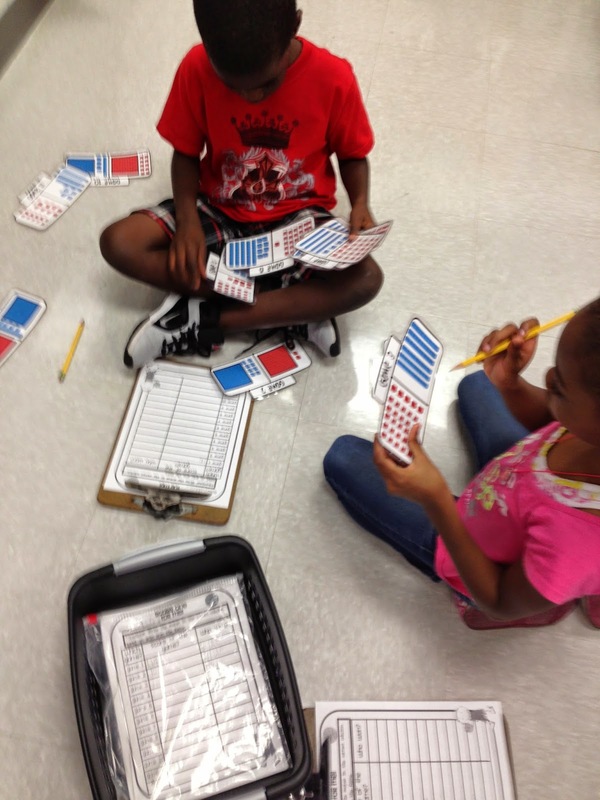 At the beginning of the year I usually have a fairly simple game going with those four students so that I can monitor what is going on around the room as well. Phew- are you tired???? Well I am! I am not going to make any promises about when I will be back with more. HA! 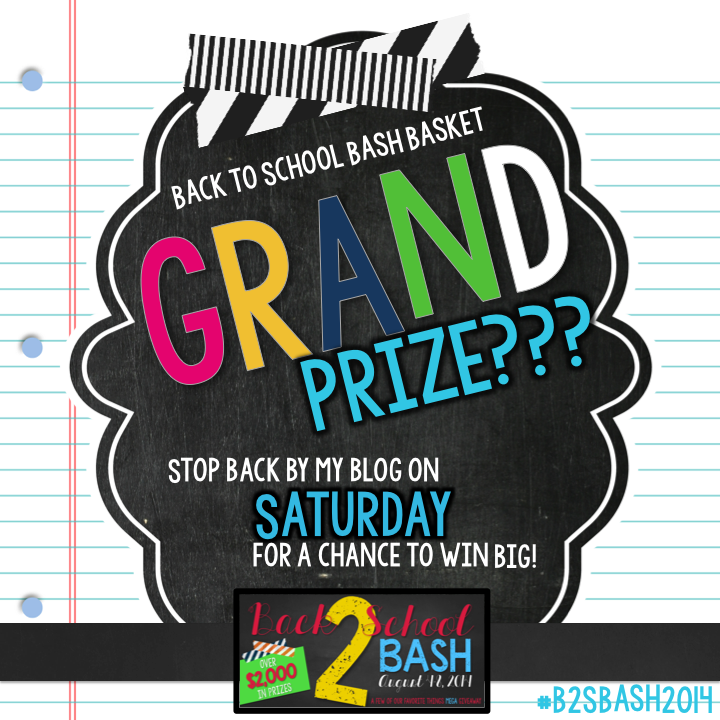 But, I do plan on writing a Part 3 that shows what will be in my baskets the first two weeks of school! 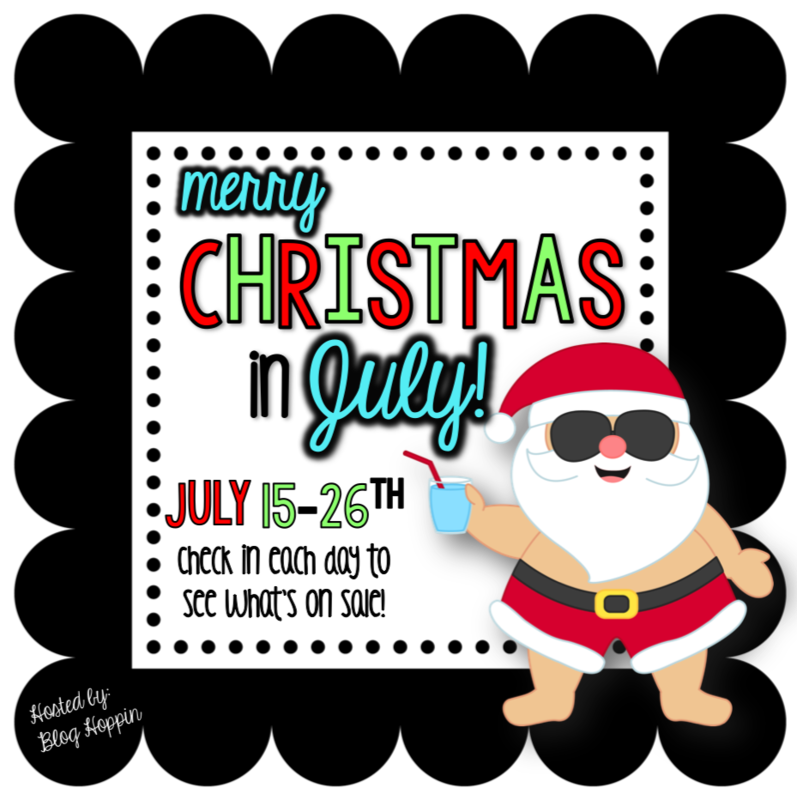 Until then, do not forget to check out my Christmas in July Sale that just so happens to be Math Work Stations right now! Our Fourth of July Trip!